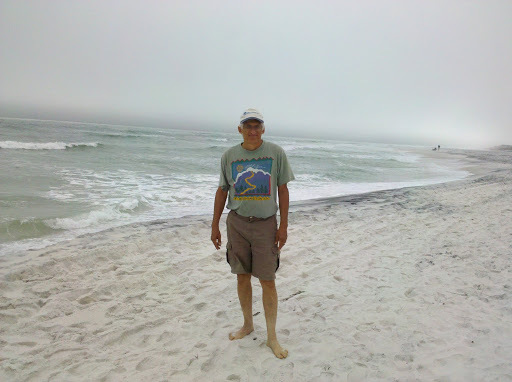 We did not find the sunny weather that we hoped for when we drove to Florida’s Emerald Coast, but after driving for 2 days through rain we were happy that at least it hasn’t rained while we’ve been here. And even with the fog and overcast skies we can see why this area along the Gulf of Mexico is considered to have some of the most beautiful beaches in the world. The sand is made up of pure Appalachian quartz, which reflects sunlight back up through the surf and gives the waters a remarkable emerald-green color. Walking barefoot on the soft, white, sugary sand soothes the toes and when you want to put your shoes back on it seems the sand falls right off leaving your feet feeling clean instead of gritty. We had hoped to camp when we got here but the first night it looked like rain and we decided to get a motel instead. 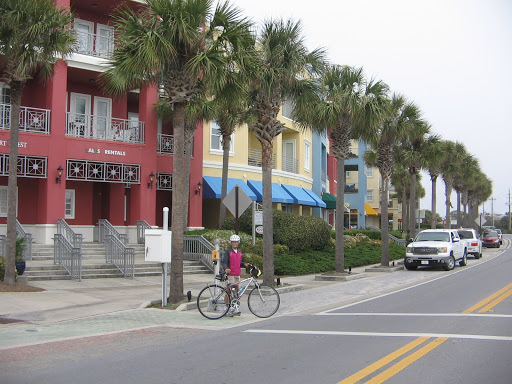 We stayed in Destin, Florida. Lee took a chance on finding the name of an old high school friend in the phone book for the nearby town of Niceville. They hadn’t been in contact for over 30 years, but Lee thought that Larry still lived in Niceville. Sure enough, his name was there, he answered the phone when Lee called, and he was delighted to hear we were in town. The next evening we enjoyed a delicious dinner with Larry and his wife while he and Lee hashed over old times. 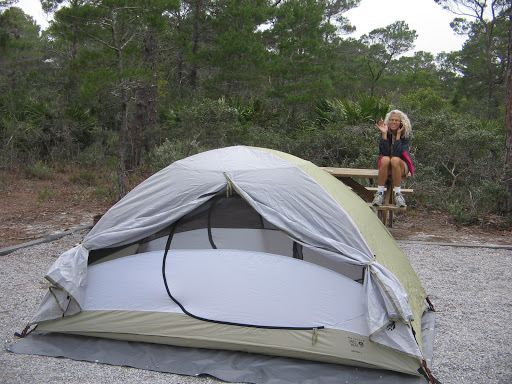 The next day the weather seemed sufficiently clear for camping and we were able to get a tent site at Topsail Hill Preserve State Park. The campsites are not on the beach, but in this cool, damp weather it was better, anyway, to be in the shelter of the pine trees. 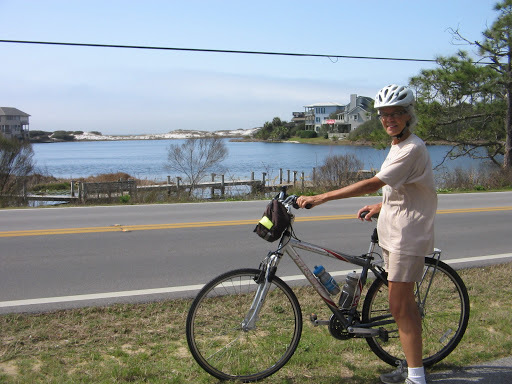 The park contains 3.2 miles of pristine beach, old-growth longleaf pine forests, wetlands, 3 coastal dune lakes and several hiking trails. 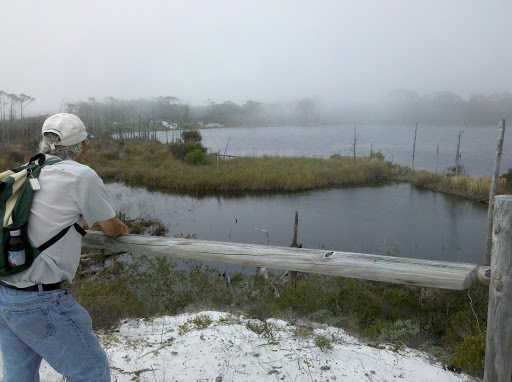 We especially enjoyed the hike to Campbell Lake and Morris Lake, 2 of the coastal dune lakes. 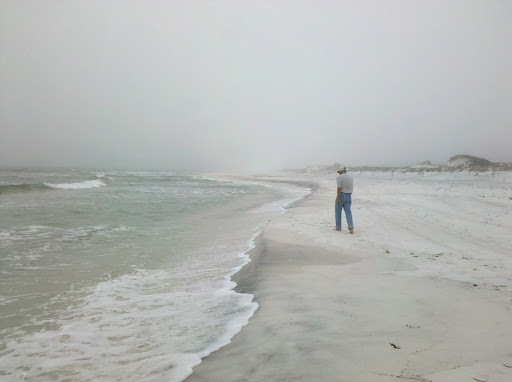 This type of lake creates an opening called an outfall, to the Gulf of Mexico during periods of high water levels causing fresh and salt water to mix. Found in few places around the world, 15 of these rare lakes are found along this stretch of coast in Northwest Florida. 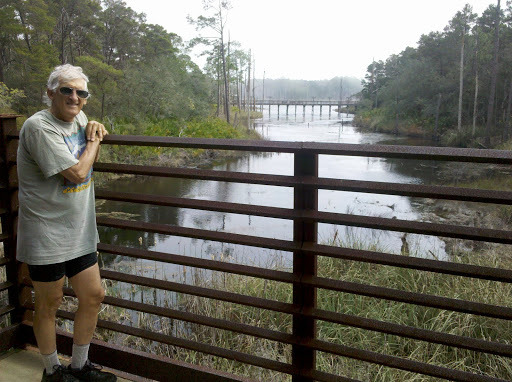 The hike not only had good views of the lakes, but there was also access to a beach on the Gulf, boardwalks through marshes and over sand dunes, and portions of trail through pine forests and oak hammocks. Because the day was foggy there was a special, eerie quality looking over the lakes and to the trees and dunes in the distance. Morris Lake at Topsail Hill Preserve State Park. 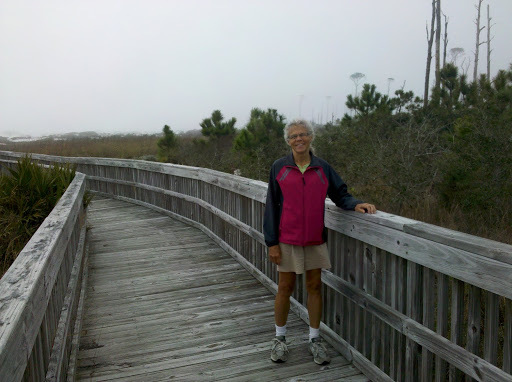 Boardwalk on Deer Track Trail at Topsail Preserve State Park. Beach access from Deer Track Trail at Topsail Hill Preserve State Park. 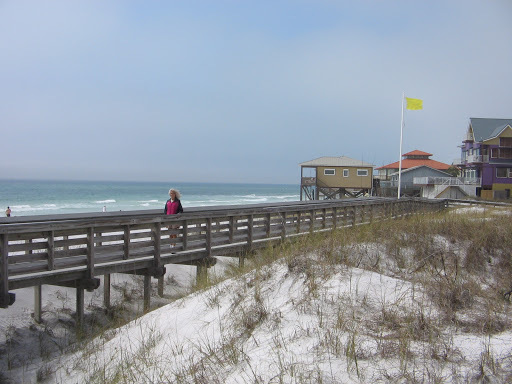 Topsail Hill Preserve State Park is part of a 26-mile stretch of the Florida Gulf Coast called the Beaches of South Walton. 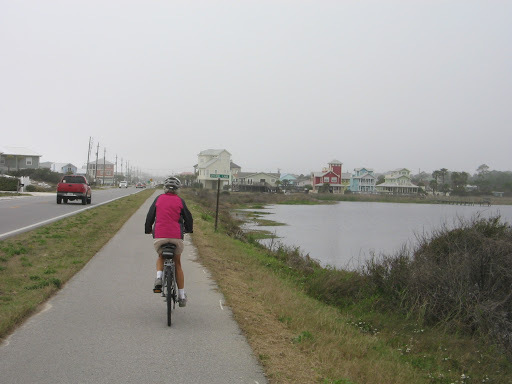 Half of the land is set aside for state parks and forests, but the other half is a popular resort area with the type of development associated with beach towns. We got an opportunity to view the contrast of nature and commercial development on the day that we rode our bikes on a portion of the Timpoochee Trail. 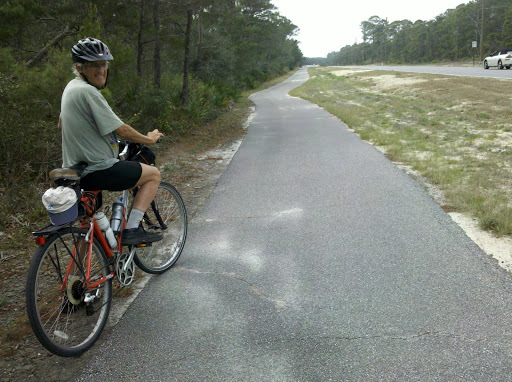 Street scenes on Timpoochee Trail through Beaches of South Walton. 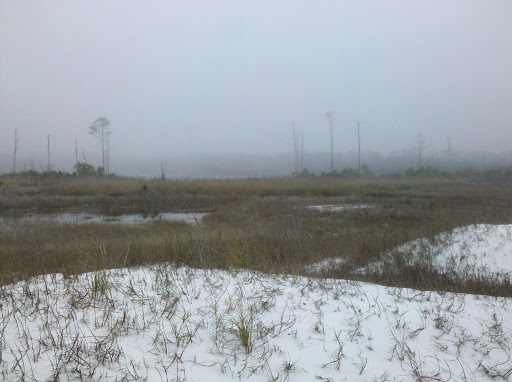 One of the coastal dune lakes along the Timpoochee Trail. Commercial development around this lake, unlike the ones in the state park. The entrance to Grayton Beach State Park is along the Timpoochee Trail. Draper Lake, another coastal dune lake along the Timpoochee Trail. Stop at Dune Allen Beach along the Timpoochee Trail. 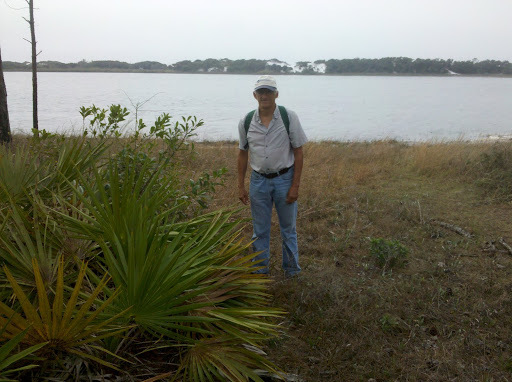 Today we will be saying good-bye to Topsail Hill and, most likely, saying good-bye to Florida. The plan is to head west and if we head west from this part of Florida, there is very little of Florida left. Pensacola is about an hour from here and after that is Alabama. It has been a great two months in Florida and there are a lot of good memories that we take with us. Next Next post: Westward, Ho!